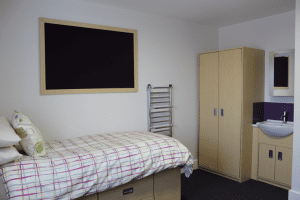 Our Summer School accommodation for Junior and Senior students is on campus in boarding residences which are all boys or all girls. The university preparation programme students live in one of our off-campus boarding residences in the village of Acton Burnell. Our residences are strictly all boys or all girls and are arranged so that our older students have a private bathroom; the younger students will share a bathroom with 3 to 4 other students. The gender and age details given below are for illustrative purposes only and may change depending on the age and gender range of the students enrolled. Bedrooms, shared areas, bathrooms and showers are cleaned every weekday with bed linen changed once per week. We have a small number of double rooms available on request.